The morning was partly cloudy when we arrived at the Raja Bhoj Airport. Despite three long flights from Jakarta (Indonesia) to Bhopal, Madhya Pradesh (India), the expression of our faces did not reflect exhaustion. Instead, we were happy to see new faces. Organizers and volunteers of the first India-ASEAN Youth Summit 2017 welcomed us with flowers, took us to the bus headed to our hotel and also the summit’s venue, the Jehan Numa Palace Hotel. There, we met with the rest of delegates from 10 other countries for the first time. Our skin tones and languages might be different, but there was one thing that bound us together: our smiles as we introduced ourselves to one another. August 14, 2017 was the first day of the five-day summit. Innagural evening was full of delegates who dressed formally for the function. Anupam Kher, the senior Bollywood actor was the first speaker delivering motivational speech to us youngsters from 11 different countries. His charming way of communicating with us made us laugh while being moved by his stories. Afterward, we had our dinner, where some of us tasted Indian foods for the very first time. At the beginning, most of us grouped together by country, finding it hard to leave our comfort zone and were reluctant to blend with delegates from other countries. The organizer, fortunately, made parallel discussion groups made up of delegates from different countries. Therefore, the parallel group discussions were a perfect occasion to get to know foreign delegates in between the summit’s tight schedules. Each group took their turns to discuss four issues -innovation and entrepreneurship, digital and IT connectivity, UN SDGs, and Polity and Governance- facilitated by different chairs who were experts in their fields. In between the parallel group discussions, we attended panel discussions on various subjects. For me personally, the most impressive speakers are Shri Sanjeev Sanyal (Principal Economic Advised in the Ministry of Finance, Goverement of India) and Smt. 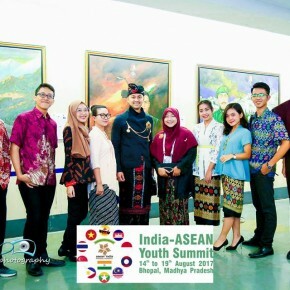 Anuradha Shankar, ADG (Administration PHQ of Madhya Pradesh), who talked about cultural and civilizational linkages between India and ASEAN, expanding my horizon on the subject. Furthermore, one representative delegate from each country presented an overview about his or her country to other delegates. We chose Sebastian Partogi and Lailatunnazhifah to represent Indonesia. As youngsters of Indonesia is now well connected with digital and the number of internet users in Indonesia is now rising, we decided to pick “The Rise of the Millennial” as the presentation’s main subject, since similar phenomenon has also been seen across ASEAN countries and India. In addition to discussions and seminars, we also visited various tourism destinations in Bhopal during the summit. Shri Shivraj Singh Chouhan, the Honorable Chief Minister of Madhya Pradesh invited us to join a cultural evening at his residence, where we had to wear our traditional costumes, resulting in a rare view of diversity coming together through the costumes, while being entertained by local artists who sing and dance. Near the end of the performance, all delegates were encouraged to come onstage to join the singing and dancing, revealing how these acts are deeply ingrained among Indian people. It was indeed an honor for us to join the function, which had been fun. On the next evening, we were awed by the beauty of the Tribal Museum, and the pristine green look of the Van Vihar National Park. The most memorable moment, however, was when we celebrated India’s 70th Independence Day on August 15. As part of the celebration, a local group of yoga experts and martial artists performed before us, giving us Goosebumps with their acrobatic moves. The acrobatic martial artist troupe turned out to be a participant of India’s Got Talent at one time. Two days after India’s independent day, on Aug. 17, was Indonesia’s turn to mark its 72nd independence day. To celebrate that day, we wore batik. Delegates from other countries spontaneously congratulated us Indonesians for our independence day while we were drafting the youth declaration. It felt good to be recognized by people from other countries and to see how we seemed to respect each other’s historical milestones. 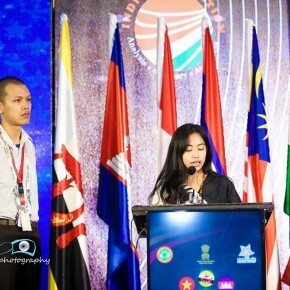 On the same day, upon reviewing the youth declaration draft, Iqbal Hariadi Putra represented Indonesian delegates to present his review of the draft on the podium. 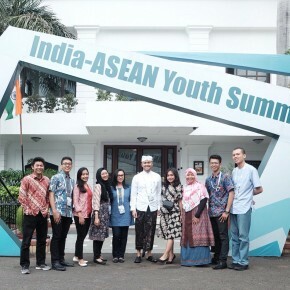 We included one point to the draft: urge India-ASEAN Youth Summit to be an action oriented forum with concrete and sustainable results, so that the summit did not stop at discussions only. We were pleased and honored to have the forum agreed to include that point on the declaration. At this moment, I remembered the year 1928, when Indonesian youngsters drafted the Sumpah Pemuda (Youth Pledge). There, young Javanese, Sumatran, Balinese and youngsters from other ethnic groups vowed to uphold only one country, one nationality, one national language: Indonesia. 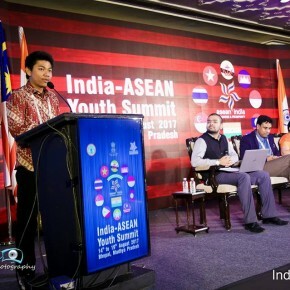 Now, through our declaration, not only Indonesian youths but also youngsters from India and ASEAN countries as well vowed to achieve a better future for India and ASEAN in the global scene. *) This article was originally published on India in Indonesia.